Stan Brakhage’s landmark Metaphors on Vision has been republished by Anthology Film Archives and Light Industry. To celebrate the re-release of this critical text by one of avant-garde cinema’s most influential figures, we will be screening a selection of rare 8mm films from Brakhage’s Song Series. 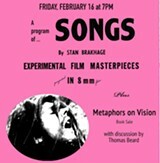 Thomas Beard, a founder and director of Light Industry and a Programmer at Large for the Film Society of Lincoln Center, will talk about the effort to re-publish Metaphors on Vision, and a limited number of copies will be available for purchase through the VSW bookstore.